Cromer, perched on the very edge of the north Norfolk coast, is famous for its tasty crabs, wide open beaches, a traditional pier complete with a theatre providing seaside special variety shows and is awash with small local independent shops. As you would expect of a seaside town rich in its fishing heritage, it has a lighthouse and a proud tradition of RNLI service. It has been said that the lifeboat service is the lifeblood of the town and the Henry Blogg Museum offers a great insight into the service's past history. 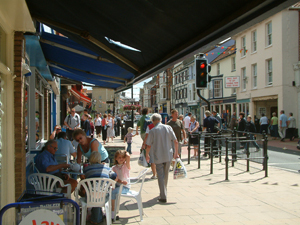 In Cromer you will find a vibrant Norfolk town with a wide variety of cafes, restaurants, shops and accommodation, all independently owned and many passed down through the ages from parents to children. Lots of these businesses are represented on our 'one stop shop' website covering Cromer. For shopaholics, in addition to traditional seaside shops selling buckets and spades and seaside gifts, we have a selection of local art galleries, homeware stores, ladies & gents fashion and fashion accessories shops. We have food stores with local produce including several fish shops featuring the famous Cromer crab and other privately owned stores including those specialising in assorted arts and crafts including baking and knitting. The town offers a wide choice of restaurants and cafes with not a single coffee shop chain or national eating or drinking venue to be found. Instead you have cafes, bars and restaurants owned and operated by local residents all eager to serve both local residents and visiting guests. With a selection of campsites, caravan parks, self-catering holiday home, B&B's, pubs with rooms and hotels you are certain to find overnight accommodation to suit your needs, both now and in the future. There are many visitors that have been coming to Cromer throughout their whole life and this pattern seems to be repeating itself. Have you re-visited since your childhood? And if you have a family connection or an interest in more of the town's history, look in at the Cromer Dictionary site. Cromer is proud to boast two blue flag beaches to explore on foot and the fabulous pier jutting out into the north sea with its end of pier shows is a great spot to try crabbing for yourself! The award winning North Norfolk coast path passes through the area and means great scenic walks are easily accessible. The town has a range of artistic, cultural and educational activities on offer and up to date listings of what's on in the town and local area can be found here. The mainly Victorian town of Cromer is ideally situated for exploring North Norfolk, the Broads, Norwich and beyond. With regular train and bus links to the Broads and Norwich it is easy to get out and explore all the area has to offer by public transport. The Coasthopper bus service makes it easy to explore North Norfolk. During the months of March to October there are several historic homes to visit, including of course the royal home at Sandringham as well as National Trust properties at Blickling & Felbrigg.